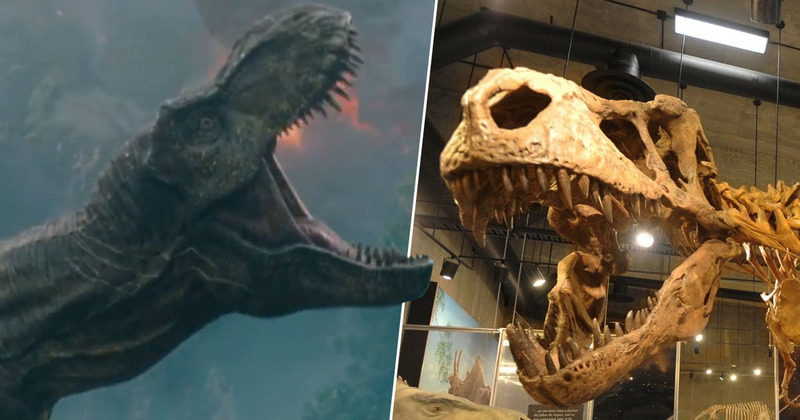 A fossil of the world’s largest ever T-Rex has been discovered in Canada proving dinosaurs were bigger than previously thought. Nicknamed ‘Scotty’, the dinosaur was found at a fossil site in Canada and is estimated to have weighed a whopping 19,500 pounds when it was alive. The remains discovered consisted of about 65 per cent of Scotty’s skeleton, including his skull, leg bones, hips and ribs. Unfortunately for poor Scotty it appears he didn’t have the healthiest of lives, with a growth between two of his teeth indicating he had an infection, and broken tailbones which could have been a result of another tyrannosaur’s bite, National Geographic reports. However, it is thought Scotty did reach a grand old age of 28, enjoying Canada’s tropical paradise some 68 million years ago. In a report titled ‘An Older and Exceptionally Large Adult Specimen of Tyrannosaurus rex’ in The Anatomical Record, study leader Scott Persons, a postdoctoral researcher at the University of Alberta, explained the discovery has shown dinosaurs were probably bigger than paleontologists first thought. As more specimens of those other theropods are found, we’re going to find their Scottys: their particularly large, particularly old individuals. It would not surprise me that those animals turn out to increase the range of body size — potentially to overlap or even surpass what we know from T. rex. More than 20 fossils of individual T-Rex have been discovered so far, making it one of the best represented extinct dinosaurs. Scotty was first dug up in 1991 at a site in Saskatchewan, but it has taken over two decades of work to fully uncover and understand his remains. With his bones being stuck firmly in the hard rock, it was difficult to extract them, but when they were finally freed Person’s team got to work, which isn’t over yet. Person is still studying the bones, currently focusing on the dinosaur’s eye crests and ‘horns’ which are on the side of his skull. The big thing that everyone is talking about is just how large this particular individual is but my favorite part of the specimen is actually the smaller details — the little bits of weirdness. Soon you will be able to see the great Scotty for yourself as his bones will be on public display at the Royal Saskatchewan Museum in Regina, Saskatchewan, this May.